BELLEVILLE – This past March, Emily Ventura was pinned against a wall, groped and forcibly kissed at a Loyalist residence. After the assault, her self-proclaimed “happy-go-lucky” attitude disappeared: “It affected me so badly. It completely changed who I was,” she said. Ventura considered this man to be her friend. They were in the same program at Loyalist and had hung out many times. She said that after the attack, going to school and having to see him in class every day was incredibly painful. “I couldn’t be around him. I was getting anxiety attacks and panic attacks. I had to leave class one day right before an important presentation. I just had to leave because I was unable to breathe,” she said. 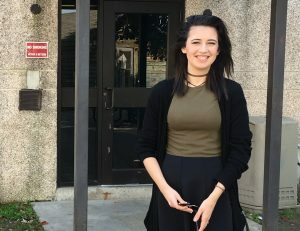 As a residence advisor at Loyalist, Ventura had been trained in dealing with incidents like this, but it turned out she was unsure how to react when she experienced it first-hand. It was a discussion with her parents that convinced her to do something about it. After talking with her family, Ventura approached a member of the residence staff to report what had happened. She was referred to security and told them her story, choosing not to press charges or involve the police. In a meeting with security and members of Loyalist’s Health and Wellness Centre, Ventura was told that she’d be kept in the loop regarding the man and what consequences he might face. But six months later, she’s had no word, though she discovered when she returned to school in September that the man was no longer at the college. “I still don’t know what happened to him,” she said. Don Sinclair, the new executive director of Loyalist’s Human Resource Centre, told QNet News that he wasn’t in charge at the time of Ventura’s assault, but is concerned with the lack of communication on the school’s behalf. Now, Ventura uses what happened to her as fuel. “I need to be more involved. I need to take this (residence) job a little more seriously than last year,” she said. The biggest mistake people can make in situations like hers is to keep it to themselves, Ventura said. According to SexAssault.ca, a website providing resources to victims, only six per cent of sexual assaults in Canada are reported to the authorities. Adam Gosney of Loyalist’s Health and Wellness Centre says people shouldn’t suffer in silence. “You don’t have to be alone,” Gosney said, adding that survivors who come forward can retain complete control of the process. If you or someone you know has experienced sexual assault on campus, call the Loyalist Sexual Assault Line at 613-969-1913, ext. 2657.